I know that I ended my last two posts by saying that my “next” post would be about goddesses, carts, and plowing and/or Plough Day. Instead I continued to write about spinning prohibitions and the goddesses/folklore figures who imposed them. Well, this post isn’t about Plough Day, either. Sorry about that. I will get to it eventually. Very soon. I promise. Meanwhile, I have been doing more reading and thinking on the topic of why and when people may have engaged in or avoided certain tasks (spinning, weaving, plowing), and the festivals or traditions that demarcate the appropriate times for these labors. I’m still just talking about Europe, here. To begin, I must start with a spelling comment. I have been spelling Rock Day “r-o-c-k“ but it is often and perhaps more correctly spelled “r-o-c“ with no “k”. A German-language thing maybe? Not being a linguist nor a German speaker, I humbly accept critical comments on this issue. I cannot endorse one spelling versus another for any reasons other than personal: I like r-o-c-k because it is more punk rock! Roc conjures images of a ginormous killer bird, which on second thought I suppose is badass in its own way. So, either way, I don’t mind. To quickly sum up earlier posts: celebrated on the day after Epiphany (the twelfth day of Christmas), Rock Day or St. Distaff’s Day marked the return of spinners to their spinning after the mid-winter holiday hiatus. Festivities were marked with the burning of flax by the ploughboys, and the dousing of the fires–and of the ploughboys–by the spinners. 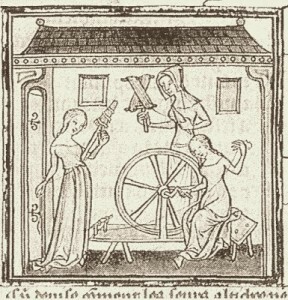 Historically in Europe, spinning was prohibited on certain days or during certain times of day. 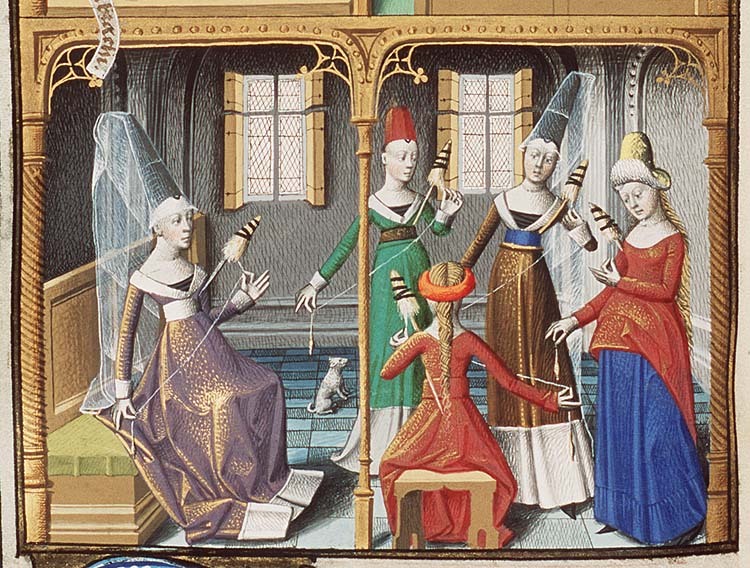 The Twelve Days of Christmas were not the only days during which spinning was banned. Depending on the region and the time period, these prohibitions were imposed by goddesses, hefty folklore figures, or the church. In general, I subscribe to a view of history that accepts this hypothesis: many traditions which came to be associated with powerful folklore figures or Christian saints in relatively recent times were, during more ancient times, the province of goddesses and gods. In the same way that geological principles of continuity help us understand how layers of the earth were created, despite significant disruptions, I like to think that continuity of human traditions through time gives us glimpses to the past, despite the disruptions of history. On the other hand, history is a tricky thing. Knowing who truly might have done what, when, where, how, and (most importantly) why is boggling in its distance and inaccessibility, yet so compelling. I try to find sources and ideas that seem reasonable, to question what seems too thin, and scrutinize what seems prejudiced. Again, I humbly accept informed critiques. Nevertheless, here are my two cents. In Celtic and Germanic regions of Europe, according to Hilda Ellis Davidson (The Lost Beliefs of Northern Europe and Roles of the Northern Goddess), there were many spinning prohibitions. In Germany, Austria, and Switzerland, two figures known by various names including Holda or Holle and Perchta or Berta, would punish spinners who worked on Saturday evenings, Sundays, or the evenings of a number of other festivals. Spinning at night was also prohibited. In the northern latitudes, it is hard to avoid doing anything after dark in the middle of winter, so an extended period of abstinence around midwinter makes sense. Holda or Perchta would punish transgressors by setting fire to their distaffs, tangling or breaking their yarn, and other terrible things. These figures also punished lazy or careless spinners no matter when they were spinning, and rewarded diligent ones. Despite their punitive aspects, these figures were also protective and beneficent. Davidson also notes that in Latvia, spinning, knitting, and chopping wood were prohibited on Thursday evenings, thanks to a goddess named Laima. Davidson comments that even though the festivals of these beings (which, by the way, included dietary stipulations including dumplings and fish on Berchta’s holiday) all took place in mid-winter, she disagrees with Lotte Motz that they represented an earlier Germanic winter goddess. Spinning is not confined to winter and their powers extended beyond the winter season. However, I am intrigued by the association between Berchtentag and the feast of the Epiphany in the Wikipedia article about Perchta (see link above). Someone with more linguistic knowledge than me will have to figure out if that association–which suggests that these holidays may be linked– is well-founded or not. In Ireland, spinning was forbidden on February 1st, the feast of St. Brigid and also the holiday Imbolg or Imbolc. February 1st was also the first day of ploughing to prepare the fields for spring planting, according to Pamela Berger in The Goddess Obscured. More on that, and on the possible relationship between spinning female characters and processional ploughs and carts, when I finally get to Plough Day. OK, back to the main topic of research: St. Distaff’s Day a.k.a Rock Day. What was it, when was it, and why was it so important? And was it ever linked with quasars? No, just kidding! It was actually linked with Plough Day. A few days ago someone on the Yahoo Flax and Linen group sent an announcement about the celebration of St. Distaff’s Day, or Rock Day, at the Westford Museum in Westford, MA on Sunday January 6th. I meant to post about it before the event actually happened, but then I had to do some research and go on some tangents, and that took a few days.